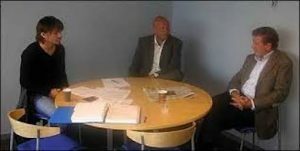 First Touch founders, Lars Bach Sorensen & Gulli Tomasson, first met in connection with Allan Borgvardt transfer from FH Hafnarfjordur in Iceland to Roy Hodgson & Viking Stavanger in Norway in August 2005 (picture on right). This was typical for the modern football world , with an icelandic agent , danish player & advisor , an english Manager as well as icelandic and norwegian clubs involved! Both Gulli and Lars had been working as youth coaches in Iceland and Denmark under license from Icelandic and Danish federations as well as advising players, coaches and clubs. Outside football Gulli had been working for international IT companies like Dell and Microsoft as well as German company Wurth in Iceland , handling sales and International contract negotiations. At the same time Lars was working outside football as a teacher since many years. In 2003 Gulli became a licensed players agent under FIFA license and has been a licensed players agent ever since by icelandic , danish and english football federations. In 2004 Gull & Lars formed an agency called ScandicManagers that would be active in Scandinavian market until 2012 , even if Lars left the agency to work as Chief Scout in Sønderjyske and Vejle Boldklub the close working relationship would still continue. In 2012 Gulli & Lars left ScandicManagers and founded First Touch Agency in a 50/50 partnership , with focus on fewer clients and high quality services. In 2018 Gulli relocated from Esbjerg to Roskilde near Copenhagen and formed First Touch East , the eastern branch of the now established First Touch agency.